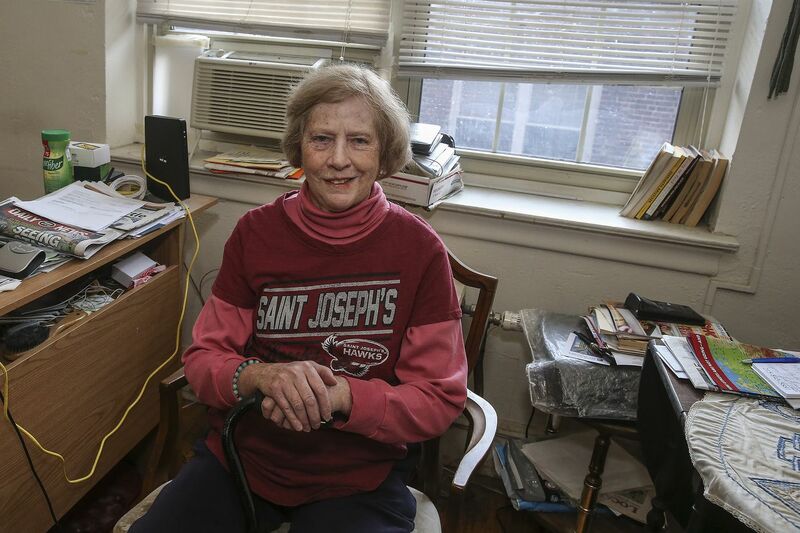 Alice Foley, 71, of Germantown, is one of an increasing number of older Philadelphians living in poverty. Never once as Foley spent a lifetime complying with the American compact — work hard, get rewarded — did she foresee a time when her refrigerator would be nearly empty whenever the calendar hit Day 30. “You’re just not prepared for poverty in old age,” said Foley, who lives on a monthly income of a little more than $900 in Social Security disability payments and nearly $80 in food stamps, an amount about $400 below the $12,140 federal poverty level for a single person. Not many people do. Yet the poverty rate of older Philadelphians is the highest among the 10 most-populous cities in the United States. About 23 percent of city residents aged 60 and above lived in poverty in 2017, three percentage points above 2013 numbers, according to new data from the Philadelphia Corp. for Aging, a nonprofit dedicated to improving the lives of older residents. The figure is just below the city’s overall poverty rate of 26 percent, the highest among the 10 most-populous U.S. cities. Compounding that, the rate of older Philadelphians living in deep poverty — 50 percent or less of the federal poverty level — rose from 6 percent to 10 percent during those same years, PCA reported. Philadelphia’s overall deep-poverty rate is 14 percent. The city’s increasing senior-poverty numbers echo national trends, which show poverty rates of people ages 65 and above rose from 16 percent in 2015 to more than 18 percent in 2016, according to U.S. census figures. There are 4.7 million people 65 and older living in poverty, federal figures show. Glicksman chose age 60 as a baseline for measuring older Philadelphians' poverty levels because it coincides with the minimum age covered by the Older Americans Act, which provides funding for various aging-related programs. In some ways, senior poverty is hidden, experts say. “A lot of people think older folks are fine because they get Social Security and senior discounts,” said Mary Fallon, executive director of UUH Outreach Program, which assists older adults in Northwest Philadelphia. “But Social Security was never designed to replace an entire income. One of the reasons numerous older Philadelphians live in poverty is that as many baby boomers have aged, they haven’t saved enough, and they haven’t anticipated the true financial costs of maintaining their health care, their homes, and their lifestyles without regular salaries, said Brian Gralnick, director of social responsibility at the Jewish Federation of Greater Philadelphia. For example, Fallon said, as “things like your hearing begin wearing out on you, you realize that Medicare doesn’t cover hearing aids.” Other similar health surprises await seniors, experts say. As for housing, 38 percent of all Philadelphia homeowners have annual household incomes below $35,000, according to the Pew Charitable Trusts. That means numerous older residents incur huge expenses simply maintaining their houses. Beyond health care and housing, just basic items people need to live, from electricity to pot roast, can suddenly become out of reach for those living on Social Security payments alone, Gralnick said. Many older Philadelphians are also caregivers for children with disabilities, or must raise their grandchildren because their children are drug-addicted, experts added. Poverty rates also are so high for older residents simply because so many people in Philadelphia live in poverty, McCallion said. “If you’ve lived a life in poverty, by the time you reach old age, there’s not much to fall back on,” he added. And these days, “it’s much less common” for people to have pensions that would augment Social Security, said Pam Walz, co-director of the Aging and Disabilities Unit at Community Legal Services in Philadelphia. For Queen Esther Waites, 79, there were no pensions from her jobs as a security guard and day-care worker. A widow with four grown children in the area, Waites lives in poverty in a one-bedroom apartment in Germantown, subsisting on a small Social Security payment and food stamps. That’s especially difficult for Waites, who has had two strokes and has a hard time pulling her food cart as she walks with her cane. Along with lack of food, many seniors may also be suffering from malnutrition, sapping them of their energy and essence. Exact figures aren’t known. Malnutrition, which occurs when a person doesn’t eat a proper amount of calories, protein, or minerals, can happen when seniors eat too little food, or too much cheap food high in fat and salt. Many low-income seniors lack money to buy enough healthy food, said Cassandra Fox, a coordinator at the Food Trust, a Philadelphia area nonprofit that works to increase access to nutritious food. “They’re absolutely having trouble maintaining good nutrition,” Fox added. Helping seniors deal with poverty isn’t easy. “It’s not like there are lots of opportunities to get a better job” for working people 60 and older, noted Cateria McCabe, an attorney at Philadelphia’s SeniorLAW Center. Organizations trying to help seniors in poverty include the AARP Foundation in Washington, the charitable affiliate of the national senior organization. Foundation president Lisa Marsh Ryerson said the foundation works to develop technology skills in older adults to re-attach them to the workforce. “The promise of longevity is terrific for all of us,” Ryerson said. “If one has work, income, and health, that’s terrific.” But, she added, a growing number of older adults without enough income could face negative outcomes. Alice Foley agrees. She stays current, attends community meetings, communicates with legislators — all to learn about and lobby for senior issues. But it can get discouraging, especially with a condition that causes dizziness that prevents her from working and doing more with her life. And then there is the near-empty refrigerator. “There are weeks on end without enough food to eat,” she said. “I learn to live on not a lot."